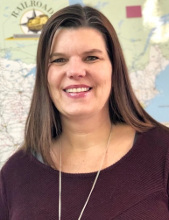 Tealinc, Ltd. has appointed Shannon Rodgers as customer support and development specialist, effective April 8, 2019. She will be based out of Tealinc’s new office in Altoona, Pa.
Rogers will assist with new business development, marketing and sales and will be responsible for providing assistance with operations and administrative support. Rodgers has more than 20 years of experience in the rail industry. She started her career with The Everett Railroad Company as an office manager/customer service representative and then later became a freight agent. She joined Watco Companies as a supply chain coordinator in 2015, where she provided tracking and tracing services for clients and formulated a system using Microsoft Access database to monitor inbound and outbound railcar shipments. The system allows users to create historical reports based on transit times, delays, shipments based on commodity, contract numbers, etc. Rogers also served as a rail fleet specialist at Watco, controlling Railinc permissions for car owners, handling lines, running repair agents, and repair shops. In this position, she also handled all DDCT incidents for more than 105 different marks, monitored cars through the shopping process to ensure timely processing, and created, renewed and monitored UMLER, LOA’s and OT-5 for car owners and handling lines.